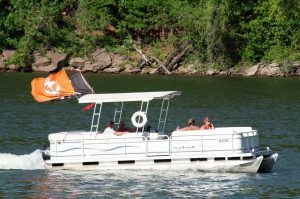 A pontoon is no small investment – and if you decided that you really want one, it’s crucial to choose a boat that will last you a long time, and one who has all the features you’re looking for in a boat. However, few people can splurge twenty grand on a brand new pontoon straight from the salon – and if you’re one of them, this article is for you. Much like any other vehicle, boats depreciate in value once driven off the lot. However, they depreciate much slower than cars and trucks – which means a 5-year old pontoon is probably equivalent to a 2-year old car – at least in terms of wear. We would recommend going for anything up to 8-10 years old – the older the boat, the better the price you’ll be able to get from the seller. However, age itself is not much of an indicator of the pontoon’s condition. Boat condition is probably the most important aspect to look at when looking to purchase a used pontoon. Its condition depends on a lot of factors – starting with the location (Florida boats are always in worse condition due to the heat, wind, and saltwater exposure), the amount of use and wear, and more. You might also want to pay attention to the aspect of the pontoons and deck – while scratches aren’t a big deal for the overall functioning of the boat (and it might actually feel refreshing to not be the first one to put a scratch on a brand new boat), you can negotiate the price over that – and sometimes quite a lot. A lot of people who want to sell their pontoons fast will usually put them up on eBay just as they are – dusty, dirty, smelly, unpolished. While the price might be tempting, I wouldn’t recommend getting a dirty boat and attempting to clean it up yourself – you’ll be up for some huge cleaning bills, or will have to go through someone else’s messes yourself – not the best scenario anyway. It’s always best to shop locally – you’ll be saving a lot – sometimes even up to a couple thousand on shipping if you find a boat locally. If you already have friends in the local marina/boating community, it’s even easier – you can even get a better price on the boat itself. Even if you’re ready to have a boat shipped to you from another state, make sure you know what you’re in for before sealing the deal with the seller – returning a boat is nearly impossible, and reselling a boat that is not as described isn’t fun either. We’tre actually looking into getting a pontoon this year and I’m really tempted by a few second-hand boats i’ve seen around, thanks for all the advice, will defos help make the best choice! Great tips man, i’m on the market for a second hand pontoon right now and really need to know what to look for to save myself time and money!